Mardi, c’était la journée des femmes, pour l’occasion je vous propose d’en découvrir un peu plus sur une femme engagée qui fait un boulot extraordinaire pour changer l’industrie de la mode et du textile. Petit entretien avec Christina Dean, fondatrice de l’ONG Redress. Christina Dean est devenue particulièrement médiatisée après le défi « 365 jours de vêtements d’occasion » dont nous avions parlé il y a quelques mois. Tous les liens cités sont donnés à la toute fin de l’article. Last Tuesday was women’s day and I had the chance to meet with Christina Dean for this occasion. Interview with this very commited woman who founded NGO Redress, an NGO promoting a more sustainable fashion through waste reduction. Christina got particularly mediatised after the « 365 days of secondhand challenge » that we talked about a few months ago in this blog. All the links to the brands/NGO mentionned in the interview are given at the end of this post. Hi Christina, can you tell us a bit more about you and what made you create Redress? I used to be just a “normal” person, just living. Without a strong passion towards my career. I was a practicing dentist in London. I was young you know, just starting on a new career, and when you are so young you do not know what your career is going to hold for you. But basically I didn’t really enjoy dentistry. So I re-trained as a journalist, and when I moved to Hong Kong, I worked there for a couple of years as a journalist, for many magazines, such as parenting magazines, or SCMP. I wrote about anything, health, travel, environment, best job ever, exploring the world. And in terms of exploring the world I landed upon the issues of China, and not just China, Asia I should say. Having come from Europe (UK), I was brought up in a very healthy environment and I never really have had to question how difficult it would be to live in a place that is not so healthy. So as a journalist I started to investigate about our wastes or how little was done to address it, and I was horrified by what I saw. I needed to do something, I started Redress. Although Redress has a bit of a different history, but that is essentially how it began. The purpose of Redress is to try and reduce wastes in the fashion industry. We try to promote sustainability in the fashion industry through waste reduction, it is particularly important in Asia, as they produce the clothes for the world (specifically China), but not just that, the economy is changing a lot in Asia too, and it is becoming a large consumer market. You were a practicing dentist, which is a highly qualified job, it requires years and years of studies to get there, and yet you gave up all that to found Redress, how has it been? Well, I think it is just that I was not passionate about it, it was not fulfilling, and I knew it was not for me. I tried my hardest but it was a real uphill struggle. Redress is also very challenging, but I can take this battle, with my heart. You work closely with large brands, how do they welcome Redress, do you feel like there is really a genuine desire to change the way they make fashion? I would say that we have never really worked with brands that were not entirely whole-hearted into finding solutions. It comes mostly from the staff I would say, individuals that are driving these projects. The staff that has the imagination and creativity to do something. Sometimes we are working with real champions (as opposed to the real corporate) that really want to do something, sometimes I feel like it is a mixture of 2. But the problem is that there is no easy solution. The brands know that they need to integrate more sustainability in their fashion, but they are worried it would cost them more, and that the consumer would not be ready to pay more. It is a bit of the chicken and egg issue, the brands fears the consumer won’t be willing to pay more, and the consumer complains that the brand does not offer them any sustainable options, and therefore keep buying the other products. So basically no matter how passionate the brand might feel about it they are really crunched in terms of price tags. How many people are now working for Redress? What would you qualify as your biggest achievement so far? We are a small team at the moment as we are between cycles (the EcoChic Design Awards just finished in January), but if I take an average we are usually 8 people, 8 to 9. And my biggest achievement is definitely still being here, after 10 years. When I started it off, I thought, well how hard can it be to run a charity, but it is such a struggle and so much hard work. It is easy to be passionate, but such a struggle financially. So I am pretty proud that we are now reaching 10 years. You could still call Redress a startup, but we are growing and we make waves and I am so proud of that. It has been such a tremendous effort to get there, for everybody. Let’s dream a bit what would be your ideal and ultimate goal through Redress/for the fashion industry? My real dream would be that when I am dead, Redress is still there. But if we are talking about an ultimate achievement for Redress, unfortunately there is no such thing. Fast fashion will always be there, and we will never overcome. We will never transform every consumers in the world, it is impossible, it is a never ending story. And we will never have a fully sustainable fashion industry as fashion is not sustainable. So unfortunately, Redress will always be fighting an uphill battle, but we win every day. If I had to really give you a goal, I would say it is to prove large brands that sustainable can also be profitable. That would be a big achievement. Because until we can prove that, the industry won’t change. The industry is starting to realize that it could be, but at a very snail pace. Is Redress going to organize some events for fashion revolution end of April? I am in touch with them now, they are doing such an amazing job. It is not quite defined yet what Redress will do, we are deep into something else much less exciting right now, and we unfortunately do not have the manpower to run everything at the same time. I was very impressed with the ECDA (EcoChic Design Awards), and how big it got, you mentioned during the show that you would like it to be the biggest worldwide sustainable fashion competition (which I already think it is) and get it to the next level, what did you mean by that? Taking it to the next level to us would be opening up to the US, Australia or New-Zealand, to make it really global. But we are not sure when it will be, we will be soon starting a new cycle (2016/17). The second thing, is more on a philosophical level. We would like to make it an incredible competition, that also happens to be sustainable fashion. But we want to show that sustainable fashion is fashion, that it is not that different, just maybe a bit more meaningful. We would like the ECDA to basically be one of the biggest competition out there, but without the sustainability being such a huge part of it. It is more about integrating this concept into the industry. What does this photo (of Citygate Outlet) inspire you? That image to me, I have seen it a million times, I think it is quite quiet actually (laughs) compared to Causeway Bay (Hong Kong Island shopping district) that is just hell. Just the amount of people on the streets… It is a beautiful photo though, the colors look nice, not sure that was the answer you expected? (laughs) I was in town on Saturday with my husband, I am always so busy during the week that I never take the time to walk on the street or enter in a shop, neither did I on Saturday actually. But Saturday I decided to look a bit around and try to understand what people buy and why do they need all that. I really do not understand what people need. To get back to the photo, my bemusement and bewilderment is more, what do people buy, where do they even put it, what purpose does it serve in their lives, and when are they going to have time to use it? We just have too much stuff in our lives. So to me this is what this photo brings up “Oh, I want it, I need it, I have to get it” but it does not really bring them any joy and as far as I am concerned it is just a waste of money. When it comes to sustainable fashion, the same names tend to always come back, like Orsola de Castro, Livia Firth, Carry Somers, Vandana Shiva or your name, and lots of people talk about celebrities like Emma Watson, Jessica Alba or Melanie Laurent, Coco Eco also does the top most influential woman in green, so where are the men? Do you think that as women, mothers (or maybe mothers to be) we instinctively want to fight for a better future for the planet? Or is it because we are the major fashion consumers? I think it is a little bit of everything. Generally the world of sustainable fashion promotion advocacy is more led by women. That might be because we are major fashion consumers, that might be because we are more sensitive, but that is a bit of a mass generalization. It might also be because, for example today is women’s day, and women feel passionately about other women that are trapped in the garment industry (80% of the workforce in the garment industry are women). Perhaps it has driven some more female advocates. Also, if you look, many of the famous names that support sustainable fashion are former models. So they have been part of this industry. Like Bonnie Chen, our ambassador, Lily Cole, Erin O’Connor. As models, they have seen it. For actresses, most of them use their names and celebrity to defend a cause, some choose fashion, some choose poverty, so it does not really mean anything. But I would not say that it is only led by women. Many men are also involved, like singer Pharrell Williams for G-star Raw with “Raw for the ocean” (Recycling plastic from the ocean), surfer Kelly Slater with Outerknown (Recycling plastic from the ocean and old fishnets), actor Edward Norton for Osklen, adventurer David De Rothschild with The Lost Explorer or Tom Cridland who has recently launched the 30 years old sweatshirt (a very very durable sweater that is guaranteed to last at least 30 years old). His whole message is against over-consumption and to promote durability. So there are definitely men out there, but maybe more on the brand/product or environmental side. Everytime I see you you are super well dressed, do you mostly dress with secondhand clothes? How do you pick your clothes? Well my clothes are mostly secondhand, I have not bought any new clothes in the last 5 years. But to me, my wardrobe always has way too many clothes in it. I would say my wardrobe is about 80% secondhand, the others are just clothes that I have had for a very long time. However, the jumper I am wearing today, I bought it new and it is very rare! It is actually the only garment I bought in the past 5 years. If I had to buy new, I would usually only buy clothes made from recycled/upcycled materials. Do you know amazing sustainable fashion designer Johanna Ho? She is launching a new collection made from recycled materials, and I have to confess I might give in. For this jumper (Knotti in PMQ) I also made a massive allowance, as I am very strict but it was my friend Denise Ho, and it was made in Hong Kong, supporting old people. But basically everything that I wear is pretty old, actually I should not say that, because most of the clothes we sell “secondhand” during our pop-up shops are pretty new! Would you have any fashion tips to share on how to always look good without having to buy new clothes all the time ;)? Bonjour Christina, est-ce que vous pouvez nous en dire plus sur vous, et ce qui vous a amenée à créer Redress? J’étais quelqu’un on ne peut plus normal, qui vivait sa vie, mais sans réelle passion pour sa carrière. J’étais dentiste à Londres. J’étais très jeune, et je débutais tout juste ma carrière, et quand tu es si jeune, ce n’est pas toujours facile de savoir ce que ta carrière va te réserver. Mais on peut dire que je n’aimais pas particulièrement être dentiste. Donc j’ai décidé de suivre une formation de journaliste. Après mon arrivée à Hong Kong, j’ai travaillé 2 ans en tant que journaliste pour différents magazines dont SCMP. J’écrivais un peu sur tous les sujets, santé, voyage, environnement. C’était un boulot passionnant, j’explorais le monde. Et c’est en explorant que je suis tombée sur les problèmes environnementaux en Chine. Et pas seulement en Chine, en Asie en général. Je venais d’Europe où j’avais grandi dans un environnement sain, je ne m’étais jamais demandé ce que ce serait de vivre dans un environnement pollué. Donc en tant que journaliste j’ai commencé à enquêter sur tout ça, sur les déchets, ce que l’on jette, et le peu qui était fait pour résoudre le problème. Et ce que j’ai vu m’a horrifiée. Je devais vraiment faire quelque chose, et j’ai donc fondé Redress. Quoique Redress a une histoire un peu différente, mais en gros, ça a commencé comme ça. Le but de Redress c’est de réduire les déchets dans l’industrie du textile. On essaie de promouvoir la durabilité dans le monde de la mode, en mettant l’accent sur la réduction des déchets/des rejets dans l’environnement. Et c’est particulièrement important en Asie, car ils produisent les habits du monde entier (particulièrement la Chine) mais aussi car le marché est en train de changer ici et les gens consomment de plus en plus. Vous étiez dentiste, ce qui représente des années d’étude, et pour autant vous avez tout abandonné pour fonder Redress, ça n’a pas été trop difficile ? Pour être honnête, je n’étais pas passionnée, ce n’était pas particulièrement épanouissant et je savais que ce n’était pas pour moi. J’ai vraiment essayé, mais c’était une vraie bataille. Redress peut aussi être terriblement éprouvant, mais cette bataille, je l’accepte de bon cœur. Vous travaillez avec des grosses enseignes/marques, comment accueillent-t’ils Redress et est-ce que vous ressentez un réel désir de changer la façon dont ils fonctionnent ? Je dirais que nous n’avons jamais travaillé avec des marques qui n’étaient pas impliquées à 100% pour trouver des solutions. Mais ça vient souvent plutôt des employés, d’individualités qui lancent ces projets. Les employés débordent d’imagination et de créativité. Il nous est arrivé de travailler avec des véritables « champions » (et non l’entreprise), et puis parfois c’est un peu des 2. Mais le problème c’est que les solutions ne sont pas évidentes. Les marques savent qu’elles doivent intégrer plus de durabilité dans leur façon de produire, mais elles sont inquiètes que ça leur coute plus cher, et que le consommateur ne soit pas prêt à payer plus. C’est un peu le problème de l’œuf et de la poule. Les marques ont peur que le consommateur ne soit pas prêt à payer plus, et le consommateur se plaint de ne pas avoir de choix plus respectueux de l’environnement, et continue donc d’acheter les autres produits. Quel que soit l’implication d’une marque on en revient toujours au prix sur l’étiquette. Combien de personnes travaillent pour Redress? Quelle est votre plus belle réussite ? Pour l’instant nous fonctionnons en petite équipe car nous sommes entre 2 cycles des ECDA (les EcoChic Design Awards qui ont fini en janvier), mais je dirais qu’en moyenne nous sommes 8/9 personnes. Et ma plus belle réussite c’est que nous sommes toujours la, 10 ans après ! Quand j’ai commencé, je me disais « oh, monter une association, ça ne doit pas être bien compliqué » et j’avais vraiment sous-estimé la lutte que ça allait être au quotidien, et l’énergie que ça prendrait, pour trouver les financements par exemple. Je suis vraiment très fière que nous fêtions nos 10 ans. On peut encore nous qualifier de start-up mais nous continuons de grandir et nous faisons des vagues, et j’en suis très fière. Ça nous a demandé à tous des efforts phénoménaux. Si nous rêvions un peu, quel serait votre rêve absolu pour Redress/l’industrie de la mode? Mon grand rêve serait que même le jour où je ne suis plus de ce monde, Redress continue d’exister. Mais si nous parlons de but ultime pour Redress, malheureusement, il n’existe pas. La mode de qualité médiocre produite en masse (Fast Fashion) existera toujours. On n’arrivera jamais à changer tous les consommateurs du monde entier, c’est impossible, c’est une histoire qui ne peut pas finir. Et nous n’aurons jamais une industrie durable et respectueuse de l’environnement, car par définition elle ne l’est pas. Donc Redress sera toujours en train de se battre, mais tous les jours nous avons des petites victoires. Si je devais vraiment donner un but, je dirais que c’est de démontrer aux marques que oui la mode durable peut aussi être lucrative. Ce serait vraiment une victoire. Parce que tant que nous n’arriverons pas à le prouver, l’industrie ne changera pas. L’industrie commence à se rendre compte que les 2 sont compatibles, mais les progrès sont encore très très lents. Est-ce que Redress organise des évènements pour Fashion Revolution fin avril ? Je suis en contact avec eux, car nous sommes leurs représentants en Asie. Ils font un boulot extraordinaire. Ce n’est pas encore complètement défini car nous sommes en plein dans d’autres choses beaucoup moins intéressantes mais nécessaires, et nous n’avons pas les ressources pour tout faire en parallèle. J’étais très impressionnée par les ECDA (EcoChic Design Awards), de voir à quel point ça a grossi. Pendant le show vous avez dit vouloir qu’ils deviennent la plus grosse compétition du monde en matière de mode durable (même si je pense que ça l’est déjà !) et passer au niveau supérieur, qu’entendiez-vous par là ? Pour nous passer au niveau supérieur ce serait de s’ouvrir aux USA, à l’Australie et à la Nouvelle-Zélande, pour le rendre encore plus mondial (Pour le moment il est ouvert à l’Europe et à l’Asie). Mais nous ne savons pas encore quand cela sera. Nous sommes sur le point de commencer un nouveau cycle (2016/17) et nous ne sommes pas surs que ce sera déjà le cas pour celui qui vient. L’autre point, qui est plus une question de philosophie de la compétition, c’est qu’elle devienne un formidable concours de mode, qui est aussi en même temps un concours de mode durable. Nous voulons démontrer que la mode durable, c’est exactement pareil que la mode normale, elle a peut-être juste un peu plus de sens. Nous souhaiterions vraiment que les ECDA soit le plus gros concours de mode du monde, mais sans que la durabilité et le respect de l’environnement soit la partie la plus importante. L’idée est plus que ce concept s’intègre naturellement à l’industrie de la mode. 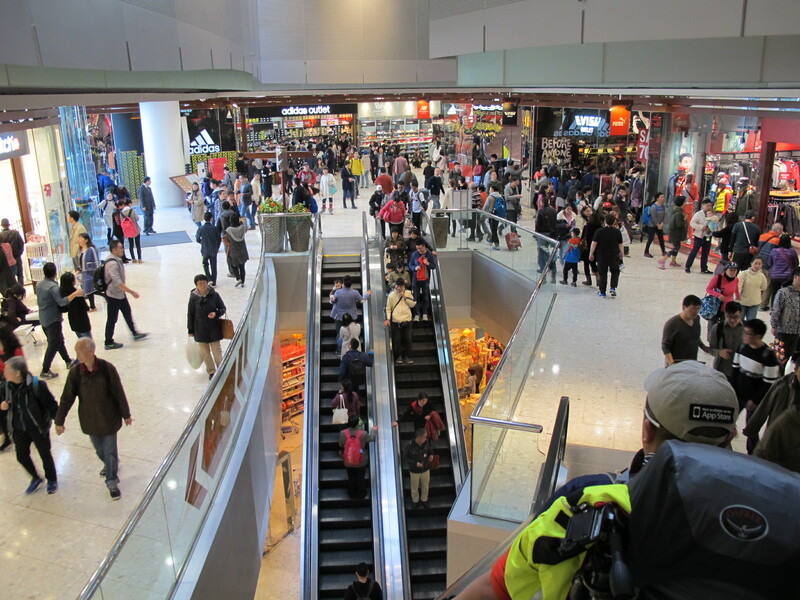 Que vous inspire cette photo de Citygate Outlet (Hong Kong) ? Cette image, je l’ai vue des millions de fois. D’ailleurs je trouve que c’est plutôt calme (rires) comparé à Causeway Bay (le quartier shopping de Hong Kong Island) qui est un vrai cauchemar. Le monde dans la rue… Mais c’est une très belle photo, les couleurs sont belles, pas sure par contre que c’était la réponse attendue (rires). Samedi j’étais en ville avec mon mari, je n’ai jamais le temps vraiment de flâner dans les rues ou entrer dans un magasin en semaine ou le week-end, d’ailleurs je ne l’ai pas fait non plus samedi, mais je voulais regarder un peu ce que les gens achètent et pourquoi ils ont besoin de tout ça. Pour revenir à cette photo, en fait elle me laisse perplexe. Pourquoi est-ce que les gens achètent autant, de quoi ont-ils besoin, à quoi ça leur sert, ou est-ce qu’ils rangent tout ça, et quel but est-ce que ça sert dans leur vie ? On possède déjà trop de choses. Donc pour moi c’est ce que cette photo m’évoque « oh, il me faut ça, j’ai besoin de ça, il faut que j’aie ça » mais ça n’apporte pas vraiment de joie, et pour moi, ce n’est qu’une perte d’argent. Quand on parle de mode durable, ce sont toujours les mêmes noms qui reviennent, comme celui d’Orsola de Castro, Livia Firth, Carry Somers, Vandana Shiva, ou le vôtre. Beaucoup de monde parle aussi de célébrités comme Emma Watson, Jessica Alba ou Mélanie Laurent en France. Coco Eco fait aussi un classement des femmes les plus influentes dans le milieu de la mode durable. Où sont les hommes ? Est-ce que vous pensez qu’en tant que mère (ou future mère potentielle), d’instinct on veut se battre pour un monde meilleur ? Ou est-ce plutôt parce que nous sommes les plus grosses consommatrices de mode ? Je pense que c’est un mélange d’un peu tout ça. En général en effet, la promotion pour une mode plus éthique et durable est faite par des femmes. Il se peut que ce soit car nous sommes les plus gros consommateurs, il se peut aussi que ce soit car nous sommes plus sensibles, mais c’est un peu faire une généralisation. Aujourd’hui aussi par exemple c’est la journée des femmes, il se peut qu’en tant que femme on se sente plus concernées par rapport aux conditions de vie/travail des femmes qui font les vêtements (80% des travailleurs textiles sont des femmes). Peut-être que ça engendre plus de militantes que de militants. Aussi, si tu regardes, beaucoup de militantes sont des ex-mannequins. Elles faisaient donc partie de l’industrie. Comme notre ambassadrice Bonnie Chen, Lily Cole ou Erin O’Connor. En tant que mannequins elles ont vu ce qui se passait. Pour les actrices en revanche, la plupart utilise leur nom et célébrité pour défendre une cause, quel qu’elle soit, certaines choisissent de lutter contre la faim, la pauvreté, d’autres choisissent la mode, ça ne veut pas dire grand-chose. Mais je ne dirais pas que ce mouvement est seulement conduit par des femmes. Il y a beaucoup d’hommes impliqués aussi. Comme Pharrell Williams avec G-star Raw with “Raw for the ocean” (Qui recycle le plastique des océans), le surfer Kelly Slater avec Outerknown (Qui recycle le plastique et les filets des océans), l’acteur Edward Norton avec Osklen, l’aventurier David De Rothschild avec The Lost Explorer ou encore Tom Cridland qui a récemment lance le sweat de 30 ans (un sweat hyper durable qui est censé durer au moins 30 ans). Son message est très axé anti-surconsommation et mode qui dure très très longtemps. Donc il y a vraiment des hommes, mais peut-être plus au niveau du produit directement, et du respect de l’environnement. A chaque fois que je vous vois vous être bien habillée, est-ce que vous vous habillez principalement avec des vêtements d’occasion? Comment choisissez-vous vos vêtements ? Mes habits sont en effet principalement des habits d’occasion, je n’ai rien acheté de nouveau depuis je dirais 5 ans. Pourtant je trouve toujours que mon placard a trop de vêtements ! Je dirais que mon placard est constitué à 80% de vêtements d’occasion et le reste de vêtements que je possède depuis très très longtemps. Cependant, le pull que je porte aujourd’hui, je l’ai acheté neuf et c’est très très rare ! En fait c’est peut-être le seul vêtement que j’ai acheté neuf ces 5 dernières années. Si je dois acheter neuf, j’essaie de privilégier les matières recyclées/upcyclées. Tu connais Johanna Ho, une incroyable designeuse de mode durable ? Elle lance une nouvelle collection en matériaux recyclés, et je dois avouer qu’il se peut que je cède ! Pour ce pull (Knotti) j’ai aussi fait une énorme concession sur mes principes, mais c’était mon amie Denise Ho, c’était fait à Hong Kong, et cet achat aide les personnes âgées (qui l’ont tricoté). Mais en gros, tout ce qu’il y a dans mon placard est plutôt ancien, en fait non je ne devrais pas dire ça, car la plupart des vêtements « d’occasion » vendus lors de nos pop-up shops sont en fait quasiment neufs ! Est-ce que vous auriez quelques conseils à partager avec nous, sur comment être toujours au top sans avoir à toujours acheter plus 😉 ? A reblogué ceci sur Maquisarde. L’engagement de Christina est impressionnant, ça donne vraiment la motivation d’envisager la mode différemment!